Synopsis: When fifteen-year-old Julia Beaufort-Stuart wakes up in the hospital, she knows the lazy summer break she’d imagined won’t be exactly like she anticipated. And once she returns to her grandfather’s estate, a bit banged up but alive, she begins to realize that her injury might not have been an accident. One of her family’s employees is missing, and he disappeared on the very same day she landed in the hospital. Thank you to Disney-Hyperion & Netgalley for this ARC! Scottish history? Thieves? Travellers? There’s a lot to love about Elizabeth Wein’s The Pearl Thief. Richly researched and always accessible, it’s something that I always admire when I am reading her books. I feel like I learn so much, even if it may not always be perfectly accurate. I am going to state something: I did nearly DNF this book. The beginning is very, very, very slow, and I wouldn’t fault readers for ditching this one early given the beginning. However, I found for me, each section of the novel really did grow on me, bit by bit. This is a story that slowly builds to it’s climax, and it takes its time. That actually does make it somewhat different from Wein’s other books (and I’ve read all of her historical fiction to date). For me, this book was less about the characters and more about what is happening in Scotland regarding the river pearl industry, as well as a larger family conspiracy regarding pearls and Mary the Queen of Scots. The mystery in this book, much like the writing, is a slow burn and I think for some readers that will be problematic. I am fine with a slow burn if the build up still keeps me interested, and I won’t lie, sometimes this book meandered in ways I didn’t always enjoy. If you’ve read the other books in the Code Name Verity series, I think you’ll still enjoy this installment. It’s definitely very different from some of the other novels in the series, but I still think Wein is a fantastic writer with the ability to capture locations in a way that is vivid and emotional. The Pearl Thief is a solid book, but it’s hard to capture the magic of the other books in the series in the same way. This entry was posted in Uncategorized and tagged arc review, book review, disney-hyperion, historical fiction, netgalley, Sam, ya, young adult on June 10, 2017 by samcmar. 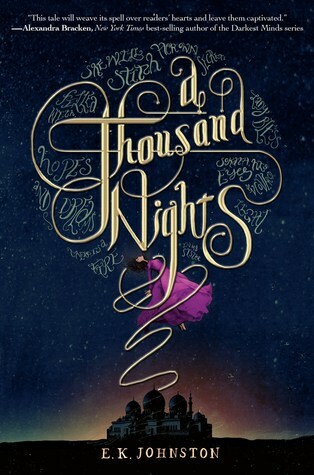 I wasn’t sure what I was getting into when I requested A Thousand Nights. I knew it was a retelling of ‘A Thousand and One Nights’, which is a story I admit, I haven’t read too many retellings of. What I loved about this novel was the prose and that is truly what sucked me in from the get go. Everything about E.K Johnston’s writing comes across slow, methodical, and precise. No one other than Lo-Melkhiin has a name, There’s a real subtle mystery behind that, and yet I was still able to oddly keep track of the various characters in the story. I was intrigued throughout why Johnston did this. I really enjoyed how the narrative was told, especially because we are getting the perspective from a storyteller who is reaccounting her story, and I loved that about this novel. There’s always this bit of me that kept asking if the story was true, embellished, or a bit of both, and yet I didn’t care at the same time. I wanted to see and know what was happening in this world, and I loved the way in which the narrator paints a lot of the story. There’s a lot to keep you guessing in this story. There’s various perspective changes on Lo-Melkhiin, there’s political intrigue and strife, a war on the verge of outbreak, and family woes that are in need of repair, and it just keeps you going. This book isn’t fast-paced in the slightest, and I think people will hold that against it, but I don’t think slow and thoughtful books are necessarily a bad thing, especially if they are building to an excellent climax, which A Thousand Nights certain does. Do parts drag a bit? Yes, but again, there’s this thoughtful building that just kept me reading. Even if these characters didn’t have names, I still felt connected to them. I feel like E.K Johnston’s book is going to go under the radar due to another huge ‘One Thousand and One Nights’ retelling, and I do feel that is unfair. The books couldn’t be any more different! But I feel like this one, although a bit more literary in tone, has a lot to offer those who are patience readers and those who love to try and put puzzles together. There’s so much mystery and intrigue here, topped with Johnston’s gorgeous writing. I definitely recommend A Thousand Nights, but be patient with it, as it doesn’t reveal it’s hand right away. This entry was posted in Uncategorized and tagged arc review, book review, disney-hyperion, fantasy, Hachette Book Group Canada, retellings, Sam, ya, young adult on October 6, 2015 by samcmar. Synopsis: Serafina has never had a reason to disobey her pa and venture beyond the grounds of the Biltmore estate.There’s plenty to explore in her grand home, although she must take care to never be seen. None of the rich folk upstairs know that Serafina exists; she and her pa, the estate’s maintenance man, have secretly lived in the basement for as long as Serafina can remember. But when children at the estate start disappearing, only Serafina knows who the culprit is:a terrifying man in a black cloak who stalks Biltmore’s corridors at night. Following her own harrowing escape, Serafina risks everything by joining forces with Braeden Vanderbilt, the young nephew of the Biltmore’s owners. Braeden and Serafina must uncover the Man in the Black Cloak’s true identity before all of the children vanish one by one. Huge thank you to Disney Hyperion and Netgalley for this ARC! 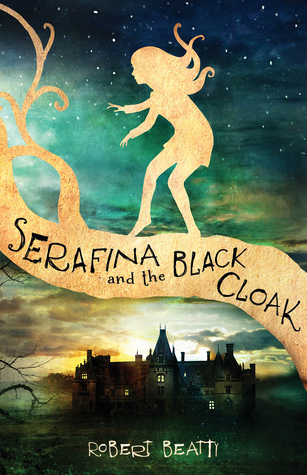 To be honest, I didn’t know what I was getting into when I requested Serafina and the Black Cloak. I figured it would be a much darker middle grade novel, except it was a lot darker than I originally anticipated. This novel is dark, on par with The Cavendish Home for Boys and Girls in terms of eerie quality, and yet I found myself quite glued to this story. I also really enjoyed the relationship between Braeden and Serafina. It wasn’t like they instantly trusted each other or liked each other’s company, but I adored how their friendship grows in the novel. It’s quite magical! I mean, the ‘villain’ in this story was a little predictable, but I appreciated how Beatty wraps up the story, uncovers the mystery behind Serafina’s mother, and essentially does a great job of having the story come together in a very meaningful way. Serafina and the Black Coat is a book that will keep you guessing, and is a thrilling ride from start to finish. It’s a great adventure story with two very wonderful and strong willed protagonists, and it offers such variety in its approach to genre. The writing is lovely, Serafina’s world is vivid, and it’s just a fun and engaging read that will remind you that middle grade can be a bit edgy too. This entry was posted in Uncategorized and tagged adventure, arc review, book review, disney-hyperion, fantasy, middle grade, mystery, netgalley, paranormal, Sam on July 5, 2015 by samcmar. Synopsis: The signs are everywhere, Jory’s stepfather, Caleb, says. Red leaves in the springtime. Pages torn from a library book. All the fish in the aquarium facing the same way. A cracked egg with twin yolks. Everywhere and anywhere. And because of them Jory’s life is far from ordinary. He must follow a very specific set of rules: don’t trust anyone outside the family, have your works at the ready just in case, and always, always watch out for the signs. The end is coming, and they must be prepared. School is Jory’s only escape from Caleb’s tight grasp, and with the help of new friends Jory begins to explore a world beyond his family’s farm. As Jory’s friendships grow, Caleb notifies Jory’s mother and siblings that the time has come for final preparations. They begin an exhausting schedule digging a mysterious tunnel in anticipation of the disaster. But as the hold gets deeper, so does the family’s doubt about whether Caleb’s prophecy is true. When the stark reality of his stepfather’s plans becomes clear, Jory must choose between living his own life or following Caleb, shutting his eyes to the bright world he’s just begun to see. Huge thank you to Disney-Hyperion and Netgalley for this ARC! 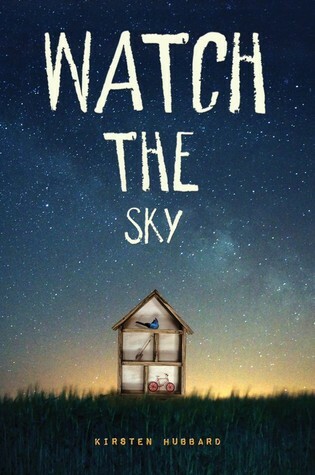 Watch the Sky was an interesting read. It tells the tale of a boy whose step-father believes in ‘signs.’ Jory is not allowed contact outside of his family and is told to trust no one. It’s a weird situation, and that’s sort of my issue with this one. Caleb, Jory’s father is a tough character to enjoy. He has this horrific strangle hold on his family because he’s convinced these signs are out to get him, sort of? He thinks in his strange hold behaviour that he is protecting his family, but he forces them to help dig a hole. There’s a scene where he gives Jory a schedule, and basically he gets two hours every night to sleep? And it’s horrific because no matter how much Jory wants to have a normal life, Caleb makes it next to impossible. A lot of his reasoning is also completely whacked out and he made me so mad! And that’s just it — Jory’s family comes across trapped under Caleb. I spent a lot of the book questioning why they would even choose to stay with him and give up having a life and being who they all want to be. It just baffled me a lot of the time because it came across like Jory’s mother didn’t have much of a spine? Part of it, which I won’t spoil, makes sense, but there’s still this frustration that you want this family to leave him. Still, this books has the trappings of a great middle grade story. Jory tries his best to try to be a normal kid at school in spite of the fact that everyone knows Caleb is insane. His insanity makes sense, it does! But it makes this novel so difficult to love at times. I question how Jory is supposed to function a lot of the time because he’s told to be ‘a man of the house’ but he has no concept of how to be social or make friends, and it’s just so sad. Admittedly, the other issue I had was how anti-climatic the ending is. It just ends, and I didn’t feel like a lot of things were entirely resolved, outside of Caleb being right about Kit. Admittedly, when the major reveal happens (which was also a bit obvious and anti-climatic) it’s the first time Caleb behaves like a human being who cares in front of his step-son. It’s the first time he treats his family properly, and it’s oddly sweet, but at the same time a part of me was annoyed because of how long it took. Again, it makes sense in the context of the story, but perhaps the issue was me wanting to smack the characters! I realize how hard I am being on this book, but I actually liked it a lot. For the most part my frustrations showed how much I was connecting with the story and trying to understand the motivations of Caleb. As a middle grade novel it treats a surprising amount about trying to do the right thing, but also how to stick up for yourself when someone is disrespecting who you want to be. Jory learns so much in the story and it’s easy to feel for him when he longs to be something his step-father isn’t seeing. Plus, Kristen Bubbard’s writing is really lovely, and even though think book made me cranky at times, it’s still a page turner and I still had to know what would happen in the end. This entry was posted in Uncategorized and tagged arc review book review, contemporary, disney-hyperion, middle grade, netgalley, Sam, science fiction on April 8, 2015 by samcmar. Synopsis: Emilia and Teo’s lives changed in a fiery, terrifying instant when a bird strike brought down the plane their stunt pilot mothers were flying. Teo’s mother died immediately, but Em’s survived, determined to raise Teo according to his late mother’s wishes—in a place where he won’t be discriminated against because of the color of his skin. But in 1930s America, a white woman raising a black adoptive son alongside a white daughter is too often seen as a threat. Seeking a home where her children won’t be held back by ethnicity or gender, Rhoda brings Em and Teo to Ethiopia, and all three fall in love with the beautiful, peaceful country. But that peace is shattered by the threat of war with Italy, and teenage Em and Teo are drawn into the conflict. Will their devotion to their country, its culture and people, and each other be their downfall…or their salvation? I confess, if Elizabeth Wein writes a novel, I automatically read it. Her books have the right kind of challenge level, often tell empowering and very human stories of flight, survival, and finding strength. Reading an Elizabeth Wein book means having unique and strongly thought out interactions, but she gives the reader so much to ponder in the process. 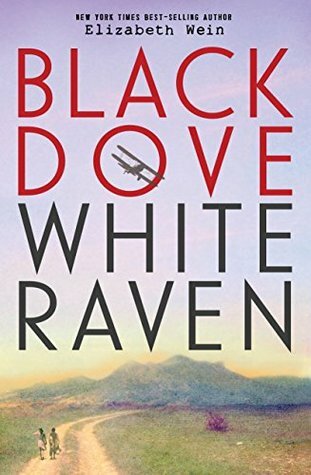 Black Dove, White Raven is probably one of her more unique books. It’s not an easy read from a written stand point, or even a topical one for that matter. She attempts to make issues of racism the forfront, while also bending history somewhat to her will to make the story accessible and engaging. I adored the cast in this book, especially Teo, Delia and Rhoda. The mom’s in particular were so enthralling and strong — such amazing role models, yet their weaknesses are so open and tough. Those two in particular just kept me wanting to know more, wanting to keep turning the pages. This book, admittedly, took me a long time to read. Stylistically its tough because it moves back and forth between a radio drama/film, to the actual main story. However, despite my slowness, I enjoyed the style once I understood its purpose and how it would affect the narrative on a whole. There’s not too many books quite like this one, where a lot of the central themes of friendship and bravery are displayed in more than one way to the reader. Plus, Wein writes amazing friendships, whether it’s Em and Teo or Delia and Rhoda, you care about their relationships and why they matter. Reading Black Dove, White Raven was wonderful and challenging at the same time. The characters are beautifully fleshed out and feel so real. If I have any complaint, the writing style is by far the book’s biggest barrier, because it’s not the easier to engage with. However, if you stick with it, the read itself is insanely rewarding. I cared as to what was happening in this novel, and I look forward to the next historical journey Elizabeth Wein takes me on. This entry was posted in Uncategorized and tagged arc review, book review, disney-hyperion, historical fiction, netgalley, Sam, ya, young adult on March 18, 2015 by samcmar. Synopsis: Maddie Fynn is a shy high school junior, cursed with an eerie intuitive ability: she sees a series of unique digits hovering above the foreheads of each person she encounters. Her earliest memories are marked by these numbers, but it takes her father’s premature death for Maddie and her family to realize that these mysterious digits are actually death dates, and just like birthdays, everyone has one. Admittedly, I’ve heard nothing but amazing things about Victoria Laurie’s novels. I figured I had nothing to lose when I requestedWhen, but after completing the book, I’m not seeing the big deal surrounding it. Part of my issues with When is how much you have to suspend your disbelief for this story to actually work. There are so many holes and aspects the reader is forced to accept, even though they don’t make a lot of sense or connect together very well. In fact, just about anything related to the FBI in this story had me completely stumped because a lot of the time none of what would happen in this story WOULD happen. I think the idea of Maddie being able to see people’s deathdates is absolutely interesting, but I feel like this has been done before. For me, personally, the level of consequence for this power should have felt much more daunting than it actual did. I think I was expecting more in the vein of “With great power comes great responsibility” but Maddie is frustrating in that she isn’t responsible, and reveals her power without a good reason! I don’t think the reason she reveals it in this story is at all valid, and again it comes from this level of belief suspension. I just couldn’t get behind this story. Yes, it’s a fast and readable book, but the holes are so glaring and I just couldn’t suspend my disbelief the way the book wanted me to. I didn’t care about the plot or the characters, and the treatment of power aggravated me in some many ways. When is not a bad book, but its expectations of the reader are certainly troublesome. If you can suspend your disbelief to the farthest reaches, you can definitely find enjoyment in this book, but it simply didn’t click with me. 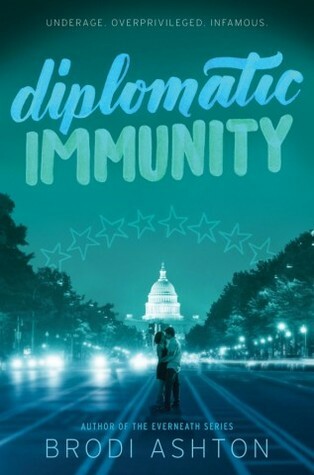 This entry was posted in Uncategorized and tagged arc review, book review, disney-hyperion, netgalley, paranormal, Sam, ya, young adult on January 13, 2015 by samcmar.